This is the first game in the TwinBee series. For other games in the series see the TwinBee category. TwinBee is an arcade game developed by Konami and released on March 5, 1985. Each player controls two jet fighters who must progress through each stage defeating a variety of strange and unusual enemies. Much like the Parodius series that the TwinBee fighters have been featured in, TwinBee lampoons the scrolling shooter genre, taking elements that are found in games like Xevious and adding humor to them. In TwinBee, two players can play simultaneously. One or two players glide along vertically scrolling stages in an effort to reach the boss and defeat it. They can shoot up into the air, and lob bombs at the ground, but only if at least one of the ship's arms are still functional. Along the way, different kinds of power ups can be collected. The most common one are the bells which must be shot out from inside clouds. The bells are bounced back into the sky by getting shot. Occasionally, a shot will change their color from the ordinary yellow. If they are picked up then, they grant the player with different power-ups depending on the color. When two people play together, they can access partnership weapons that are only available to them in a two player game. TwinBee became rather popular in Japan, but not so much in the United States. This one game lead to several direct sequels, as well as a number of spin-off games. The game was converted for play to a number of popular Japanese systems, such as the Famicom, MSX, and a near perfect translation on the Sharp X68000. It later saw a rerelease on the Game Boy Advance, and was contained a many Konami classic compilations. In the space calendar year 2801, the peaceful Donburi Island was suddenly attacked. The attack was carried out by an army led by the Spice King. Meanwhile, the curious scientist Dr. Cinnamon, who lived at the end of the island, was secretly developing two sets of fighter planes, "TwinBee" and "WinBee." Dr. Cinnamon's pupils Annamon and Donnamon volunteered to pilot the planes and bravely challenged the enemy. 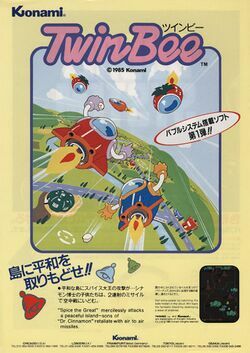 Each player pilots either the blue TwinBee ship or the pink WinBee ship. Each player can shoot upwards, or lob bombs at the ground, but only if at least one arm is remaining. If a player is shot by a bullet, and an arm is present on the side that they were hit, they lose the arm. Losing both arms will not kill the player, but getting hit again on either side will. Colliding into an enemy will cause the player to lose one life. If shots are fired into a cloud, a bell may appear. Shooting the bell causes it to bounce, and it may change color. Collected the bells when they are different colors grants different power ups. Collecting consecutive yellow bells without missing one will result in an increasing number of bonus points.